Karen Diver is currently serving as the inaugural Faculty Fellow for Inclusive Excellence for Native American Affairs at the College of St. Scholastica in Duluth, Minnesota. She was an appointee of President Obama as the Special Assistant to the President for Native American Affairs. As part of the Domestic Policy Council, she assisted with inter-agency efforts, policy and regulatory changes to benefit 567 Native American Tribes. Karen served in this position from November 2015 until the end of the Administration. Karen served as Chairwoman of the Fond du Lac Band of Lake Superior Chippewa from 2007 - 2015. 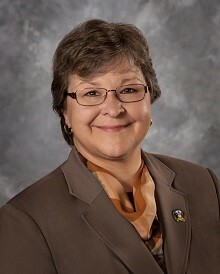 This elected position serves as chair of the tribal government and CEO of the reservation’s corporate boards. The Fond du Lac Reservation is the 2nd largest employer in northern Minnesota with over 2,200 employees. She served as Vice-President of the Minnesota Chippewa Tribe (MCT), comprised of six members Bands and chaired its Finance Corporation. She has a Bachelors in Economics from the University of Minnesota, Duluth, and as a 2002 Bush Leadership Fellow, she received a Masters in Public Administration from the Kennedy School of Government at Harvard University.